Not quite empty. It has a twin bed, a crib for our Grandbaby, and a what are they called...oh yeah an excercise bike (out of the picture) The shelf above the bed I know looks weird. It's where he had his stereo and that is coming down. I'm leaving the shelves and toying with the idea of painting them white. And I definitely want to do something different with these itty bitty closet doors. Maybe an actual door? We'll see. It has nice crown mold, so that is already done. And we are jerking up the carpet as well, and installing wood floors. Which will give it a nice fresh look! And that is the look that I'm going for, bright, fresh & clean! A happy place to be in! 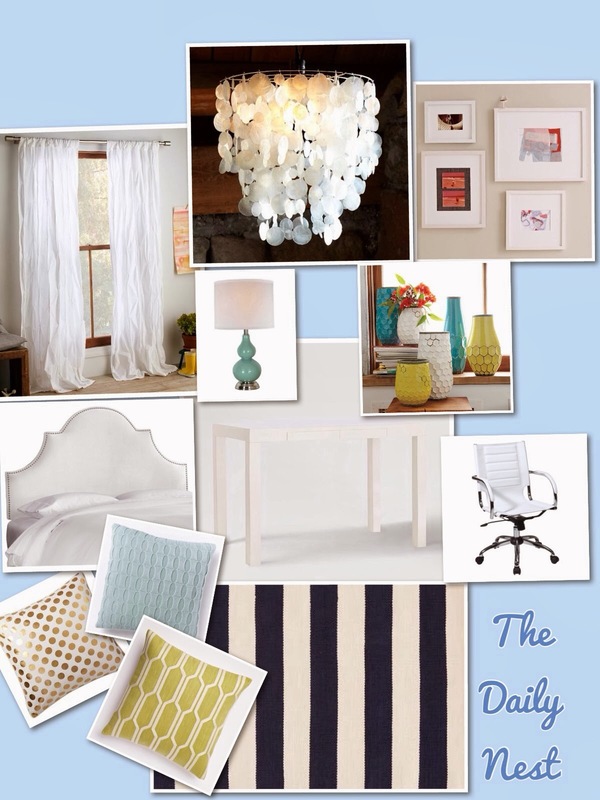 I created this mood board so you can get an idea of where my ideas are heading! 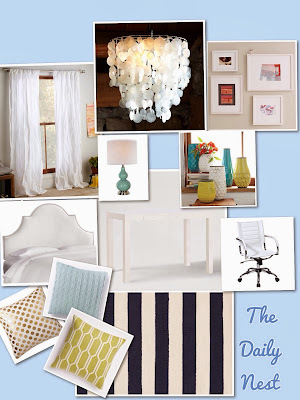 Most of these items are from West Elm Westelm.com. I've just recently discovered this store which is affiliated with Pottery Barn. It has a younger fresher look than Pottery Barn, which I'm diggin! Perfect for the look I'm going for! The wall color I'm toying with is Benjamin Moore's Palladian Blue http://www.benjaminmoore.com/en-us/paint-color/palladianblue . It's a calm and relaxed color, with a soft airy feel! It says that it combines the blue of the sky with a touch of mother of pearl! So I will keep you up to date in the next few weeks with progress pictures!